Gabe and I are happy to announce a new weekly online news show about the desktop and application virtualization industry called "Brian Madden TV." The first episode is available now. 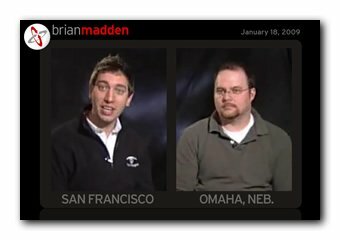 Gabe and I are happy to announce a new weekly online news show about the desktop and application virtualization industry called "Brian Madden TV." The first episode is available now. (Is this a "beta?" Or a "pilot?") The idea is that Gabe and I will release a new 15-20 minute episode each Thursday. Our first episode's topic is the 2008 year in review. For that episode we just basically sat down in front of a camera and pushed 'record.' We wanted to test the concept and figure out if we could serve video on our site and dynamically insert commercials and all that kind of stuff. So while I think the content and conversation is interesting, it's just Gabe and I talking for 23 minutes. Moving forward, we're going to try to break the show up into smaller segments, including stuff like the weekly news round-up, maybe some tech tips, interviews, conversations from BrianMadden.com, etc. We have the capability to have some fun with this too. For example, we can hook in callers via the telephone, something like "Last week I wrote about x, and one of the reader comments was particularly interesting. Let's get that commenter on the phone." We also worked out how we can do split screen / live remote interviews (news show talking head style), so Gabe and I can have hi-fidelity conversations even if we're not in the same city. We're planning to use this next week when I'm at VMworld Europe and Gabe is buried under 50 feet of snow in Nebraska. I actually attend quite a few conferences and get to meet a lot of interesting people, so I'm hoping to take the video camera everywhere and capture some interesting stuff. We also recorded a "2009 Predictions" episode (in the same style as today's 2008 year in review) which we'll probably release off-cycle in the next few days. Honestly this is one of the most fun and exciting things we've done in awhile. Please share your thoughts/comments/feedback/suggestions. Great new forum! Looking forward to future episodes. Just a thought, does something similiar to this, maybe in minisodes format, work for your vendor briefing synopses? Yeah for the vendors, I'm thinking we could do a few minutes on one each week. We could drop a card in a hat with everyone I meet with, and then at the end of each show we could randomly pick a card which will be the vendor that we cover the following week. Looks great so far and I enjoyed the first episode. It's like Sportscenter for IT (you just need a ticker across the bottom)!